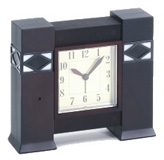 Desk Top Clock Hidden Camera Color: This high quality covert desktop clock hidden camera is perfect for surveillance. A high quality pinhole camera provides excellent video output direct to your VCR, TV or monitor. It is a nearly undetectable. It is excellent for watching the kids, baby-sitters or other security purposes. It equipped with RCA plug for direct connection with your VCR, TV or monitor. Just plug and play.